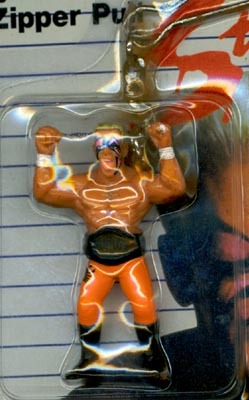 Hope Toys released figural Keychains/Zipper Pulls of four WCW stars: Sting, Lex Luger, Ric Flair & Sid Vicious. The figures were replicas of the 5 inch WCW Galoob figures, only smaller and with different colored outfits. Hope Toys also released these same small figures on Magnets and children's Wristwatches. I've only started pursuing these Keychains, so more info and pics will come later.